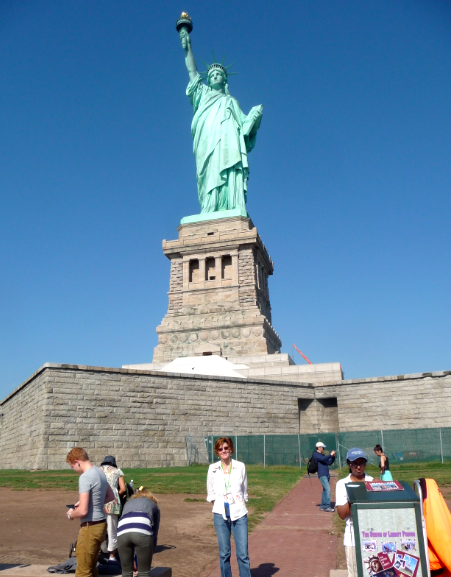 Mrs. Yollis' Classroom Blog: The Statue of Liberty! Today, students looked up facts about the Statue of Liberty, and we "jigsawed" the facts together in this post! The text is a great complement to Mrs. Yollis' photographs! The Statue of Liberty is a patriotic symbol of freedom. Visitors from all over the world come to Liberty Island to view The Statue of Liberty. 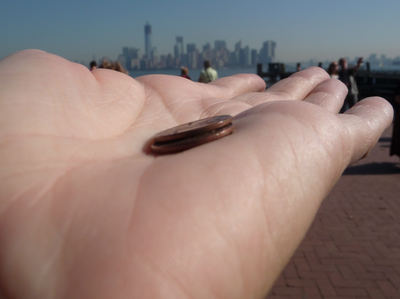 Tourist must pay a fee to board a ship that will take them to Liberty Island. The tourists approach Liberty Island. 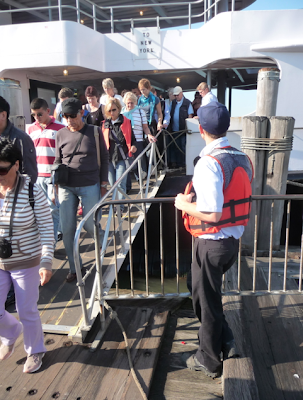 Tourists disembark the ship on a gangway. 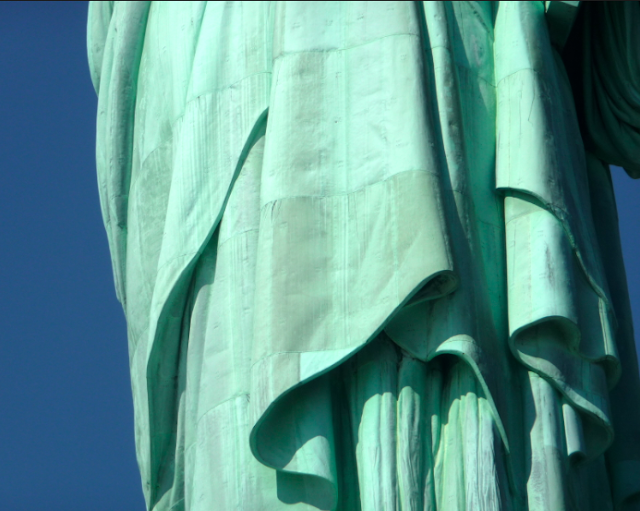 Lady Liberty, as she is nicknamed, is about 305 feet tall from the ground to the torch. She was a gift of friendship from the French. The Statue of Liberty is a symbol for freedom. Many immigrants passed Lady Liberty on their way to Ellis Island. Ellis Island was an immigration station. It is now a national monument. What does the word immigrant mean? There were many park rangers at the Statue of Liberty. 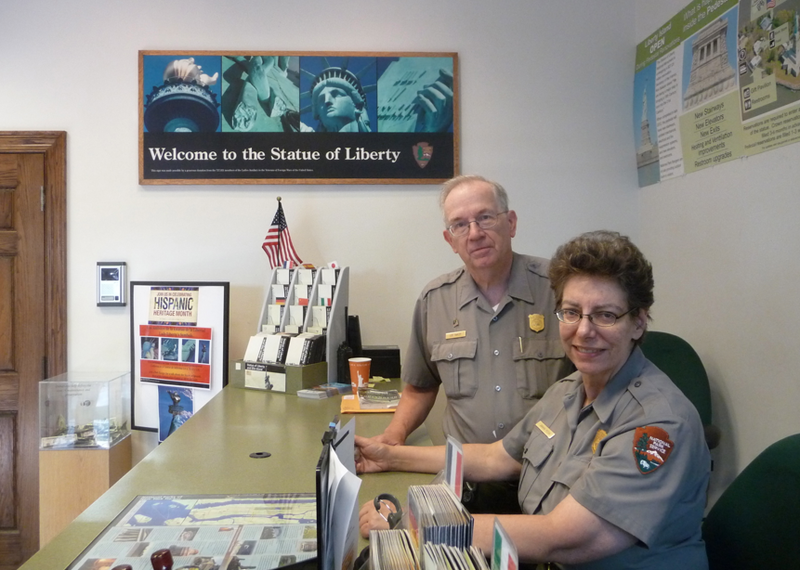 Park rangers share factual information, give tours, teach classes, and make sure tourist follow the rules of the park. Park rangers wear uniforms and have badges. The national park system has an online web ranger site! Here, a park ranger is leading a class. Read her document about Alexandre Eiffel! The statue has an iron framework on the inside, but the sculpture is made of copper. The copper is approximately two pennies thick. The Statue of Liberty is a beautiful statue from any angle. The Statue of Liberty has many special features. Each feature has its own subheading. The crown has seven rays. Each rays represents one of the seven continents. The crown will be open for visitors at the end of October! 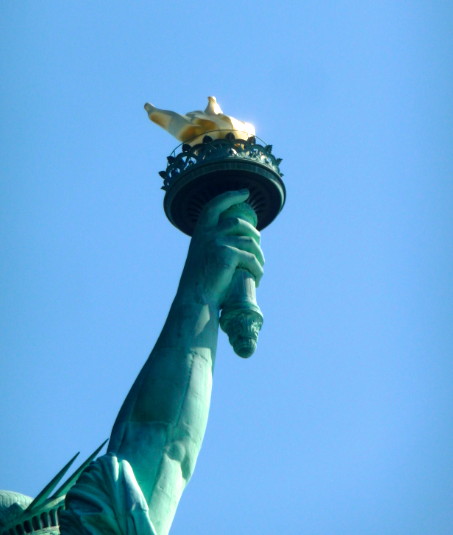 The torch symbolizes liberty enlightening the world. Liberty means freedom. 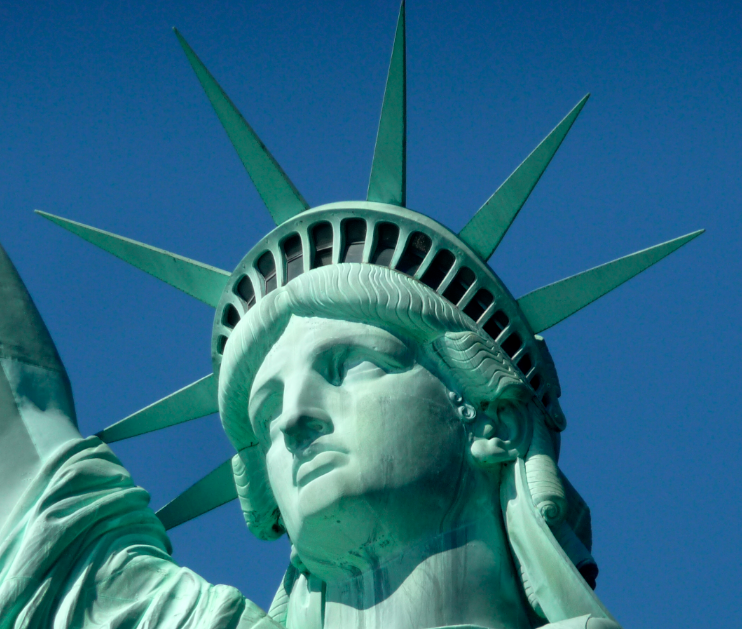 The Statue of Liberty's right arm is 42 feet in length! In 1916, flood lights were installed inside the torch. In 1984, the torch was changed. Now light reflects OFF the gold torch rather than having lights inside the torch. The ranger said the torch is covered in gold leaf. 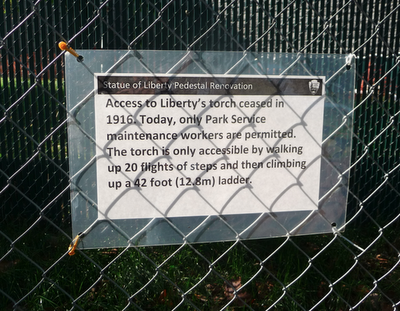 Sadly, no visitors are allowed in the torch. Read below to learn more about the torch. 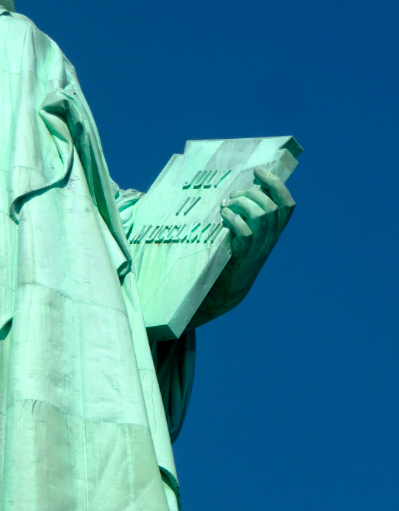 The Statue of Liberty is dressed in a Greek robe. The robe is a symbol that Greece was where democracy started. Do you see the panels of copper that were put together? She is made of 300 copper pieces. Because she was closed, Mrs. Yollis could not get a photo of the broken chains around her feet. The broken chains symbolize freedom. The tablet has July 4, 1776 on it. That represents America's birthday! The numbers are in Roman numerals. Leave a comment with 1776 in Roman numerals! Mrs. Yollis was thrilled that she got to see this powerful American symbol! She was a little disappointed that she could not go in, but is happy for the people who will get to go inside when she reopens on October 28. Can you add any new facts about the Statue of Liberty? Have you ever visited this national monument? Thank you for sharing with us all this wonderful post. I learnt a great deal of interesting information about this wonderful Statue. When I think about the USA that is the first thing which comes to mind it's such a great statue which represents so much. Is it true that high up in the crown there is a restaurant? 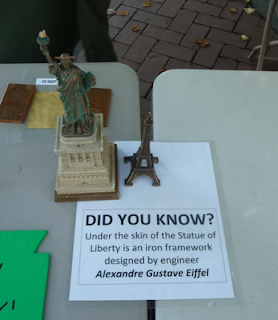 I remember reading that the statue of liberty was made by F.A.Bartholdi is this true. After reading your post I really felt like I was right there with you Mrs Yollis visiting this amazing statue. Great photos too really felt like I could touch this great statue. I'm glad you enjoyed our post about The Statue of Liberty. It was one of the highlights of my trip. I've seen so many photos of her and read many stories, but to stand at the pedestal and see her for myself was very moving. Sadly, the statue was not open while I was there. They were finishing up renovations, and she will open at the end of October. It is her 125 anniversary! Visitors can reserve a ticket to climb all the way to the crown. There are viewing windows, but no restaurant. I will always remember my time spent at Liberty Island with The Statue of Liberty. What a memorable trip! I am a teacher in New York City, and I was very lucky to meet your teacher, Mrs. Yollis, when we attended the Google Teacher Academy together. Isn't she fun?! I loved reading your post about one of my hometown's most famous landmarks, Lady Liberty. While Mrs. Yollis' photos were beautiful, my favorite part of this post was how carefully and thoughtfully you wrote up your research. I think it was very clever of you to dissect the statue into parts and then describe each section (crown, torch, tablet) in specific detail. 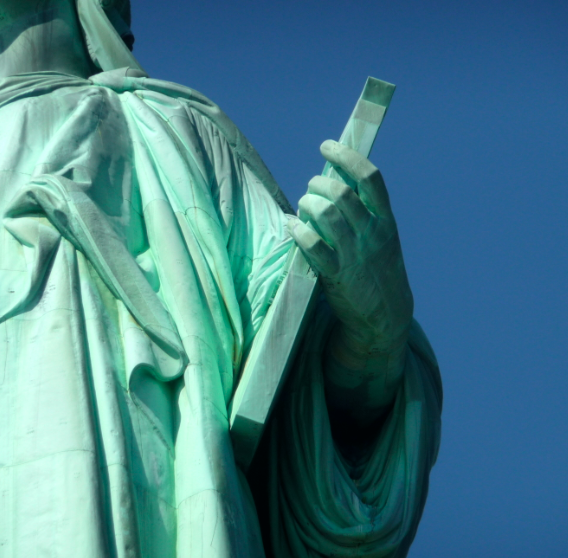 It seems like you learned a lot about the statue -- you probably know more than the average New Yorker! A huge thank you as this post you wrote was truly wonderful I really felt like I was a tourist visiting this grand lady. Your research was outstanding and you covered all the questions I wanted to know. I've been to New York City and have seen the Statue of Liberty. I didn't get to climb to the torch. It was really hot when I went, so I didn't get to see it that long. At first it was Copper, now it is greenish. I wonder who saw it when it was copper. This post brought back so many wonderful memories of my recent trip to New York City! You included so much interesting information in the post and I liked your jigsaw idea. You've shown that when working together you can achieve fantastic results. When I was visiting Lady Liberty I enjoyed listening to the audio tour, as I'm sure Mrs Yollis did. I also really enjoyed touring Ellis Island which is just a few minutes away by ferry. I bet Mrs Yollis enjoyed learning about the immigration history of your country too? I'm excited to hear that people can start visiting the inside of the statue again in just one week. It would be a long way for 4KM and 4KJ students to travel but I hope lots of Mrs Yollis' students get to visit Lady Liberty one day! 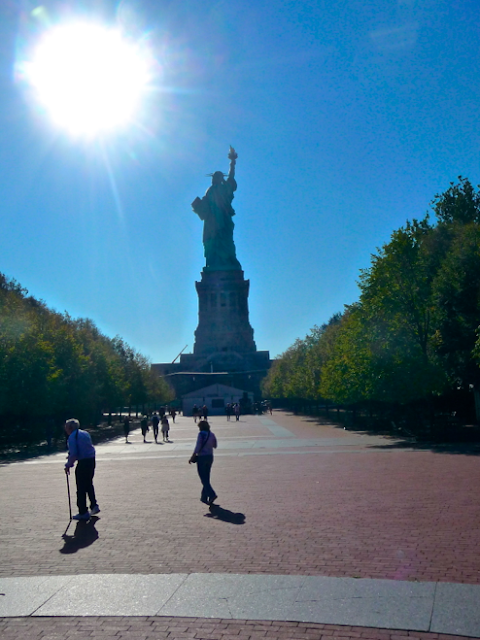 Even though I have never been to New York or had the opportunity to see the Statue of Liberty I remember what my grandmother told me about her experience. She saw Lady Liberty when she arrived in the United States from her native Croatia and said her heart was full and there were tears in her eyes. It was a very moving moment because she was going to begin a new life in a new country. You all did a wonderful job and your text compliments the wonderful photos of that very special teacher of yours. I really enjoyed your beautiful photos of the Statue of Liberty. It was really nice that you were able to take close up shots of her so we can see it very clearly. I also learned many things about the Statue from your post. I have never been to New York, but would like to go very much one day. I had been to New York many times. Sadly, I have never seen or been to Liberty Island or the statue of liberty. The tablet that Liberty is holding has MDIILXXVI in Roman Numerals. It would be delightful to see the statue of liberty. The statue of liberty represents liberty(freedom). She holds a torch that represents her full name Liberty Enlightening the World. The torch is held by the right arm. Liberty Enlightning the World is a gift from the French. The French gave the Americans the Statue of Liberty because the Statue of Liberty is a gift of friendship. Do you want to go to the top of the Satue of Liberty? Disembark means to get off a ship, aircraft, or other vehicle like: "I disembarked at Washington D.C. airport." Did you ever disembarked at an airport? P.S. What was your job to the Statue of Liberty? Mine was the right arm. P.S. (again) Here is the answer to the second Roman numeral. The answer is: thirteen. Thank you for the informative post from your trip to New York. To answer your question, an immigrant is a person who moves permanently from one country another country. I have visited the Statue of Liberty and she is truly an amazing sight to see up close and in person. Now this post was a challenge. How much of your Statue of Liberty facts did I already know? As I have never been to New York, my knowledge comes from online sources, documentaries and movies (but movies aren’t always reliable as some show it being destroyed). The Statue of Liberty is a patriotic symbol of freedom… I did know this. I can remember seeing a documentary on Ellis Island and its status as the gateway for immigrants entering U.S.A.. Seeing the excitement of the immigrants when they first saw the Statue of Liberty showed how it meant they now had a chance at a better life in a free country. Liberty Island… I have often seen films showing tourists on the island. I know I would join them if I ever visited New York. Who could go to New York and not try to visit? Liberty Enlightening the World… I didn’t know this was the real name. I thought it was only known as Lady Liberty. A gift from France… I did know this but did you know there are three replicas of the statue in France? Two are in Paris and the third is in the town of Colmar where the Statue of Liberty designer was born. Iron and copper… I did know the statue has an iron substructure and copper coating. For the outside, the greenish colour is a give away the skin is copper. Crown… I didn’t know the seven rays stood for the seven continents nor the crown isn’t always open to visitors. Torch… I knew the torch was a beacon for liberty but not that it was 42 feet long. 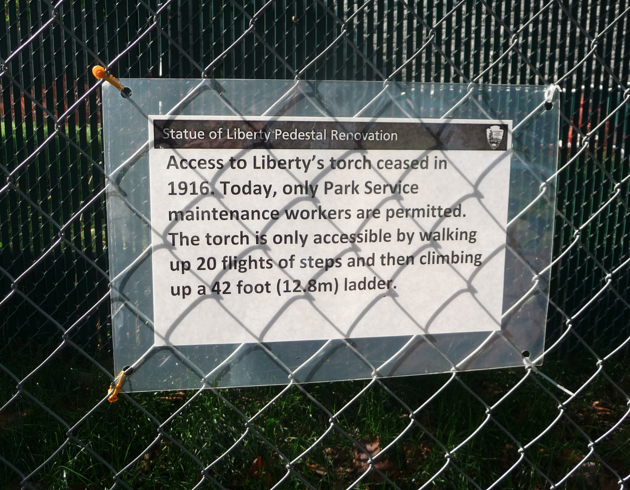 I may be wrong but I think once could climb up to the torch itself but that was stopped. I didn’t know lights had once been inside the torch. I always thought it had been lit from the outside. Even though gold leaf is very thin, it would be expensive to cover the torch. 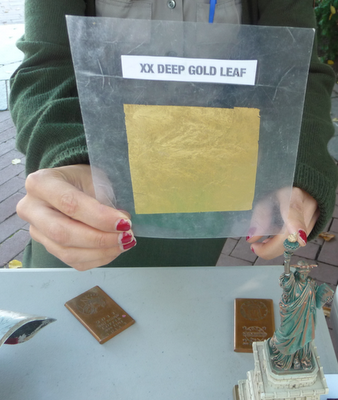 I didn’t realise it was covered in real gold. The pedestal… Being interested in geology, I recognised the pedestal was most likely granite. 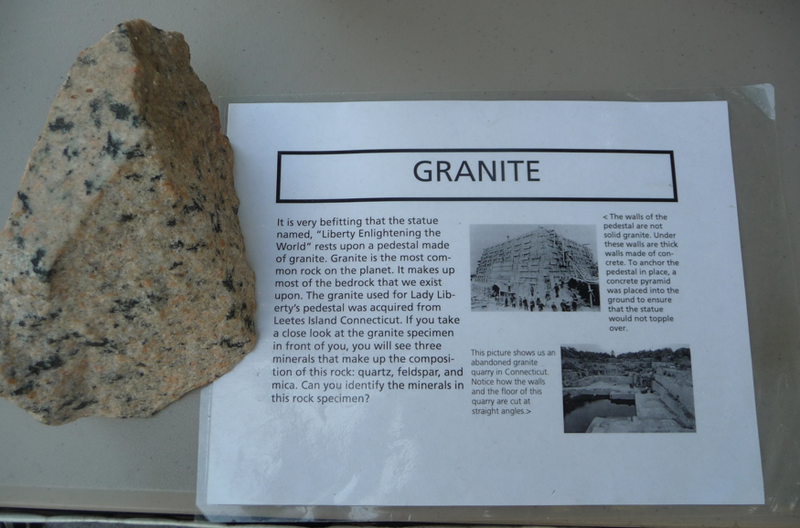 Granite is also a common, strong stone in my area. Her robe… Again I didn't know the robe was based on the ancient Greek robes but I did know the concept of democracy started in Greece. Did you know, in ancient Athens, slaves and non-citizens didn’t have the right to vote and women, whether citizens or not, also couldn’t vote? Their democracy was only for male citizens so Lady Liberty would not have been allowed to vote back then. The robe symbolises the idea of democracy, an essential part of both the United States and Australia as well as many countries. Broken chains symbolising freedom… I didn’t know there were broken chains at her feet. The tablet… I did know it had July IV, MDCCLXXVI on it. I always liked Roman numerals because they were based on five rather than our ten. Thanks for sharing the art of educational blogging! This summer I read a guest post by Kathleen Morris in Free Technology for Teachers. Her guest-post encouraged me that I was on the right track with my work with my pupils and our blogs. It also gave me inspiration to step it up when it comes to using the blog as a tool for developing of literacy. Some of her links in the post led me to you and your work with blogs in the classroom. Your work inspired me a lot! I especially love the film you and your pupils made about Quality Commenting. It´s adorable and at the same time ver informative. Last week I held a talk to a group of language teachers in a literacy network here in Uppsala, Sweden. I talked about blogs and literacy. I used my own experience of my work with pupils and blogs and blended it with inspirations from you, Kathleen Morris and Silvia Rosenthal Tolisano. It felt really good to be able to inspire and challenge these teachers to use a new tool in the classroom. Ones again: Thanks for sharing! Wow! Thank you for sharing your great work. Our second grade class is getting ready to study U.S. symbols. I can't wait to share your hard work with them. This picture brings back memories from when my wife and I traveled to NYC. I adored the torch and the statue made me feal proud to be an american. 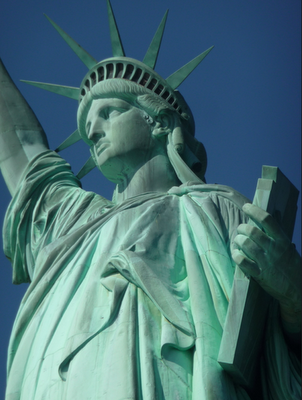 Did you know that the Statue of Liberty is 297 feet tall?! My mom says that I will go there one day. I'm excited. My mom was born in New York and that's where the Statue of Liberty is. This past summer our family traveled to the East Coast to visit family in Boston, Vermont, and New Jersey. One of the many highlights of our trip was taking a harbor cruise around Manhattan. 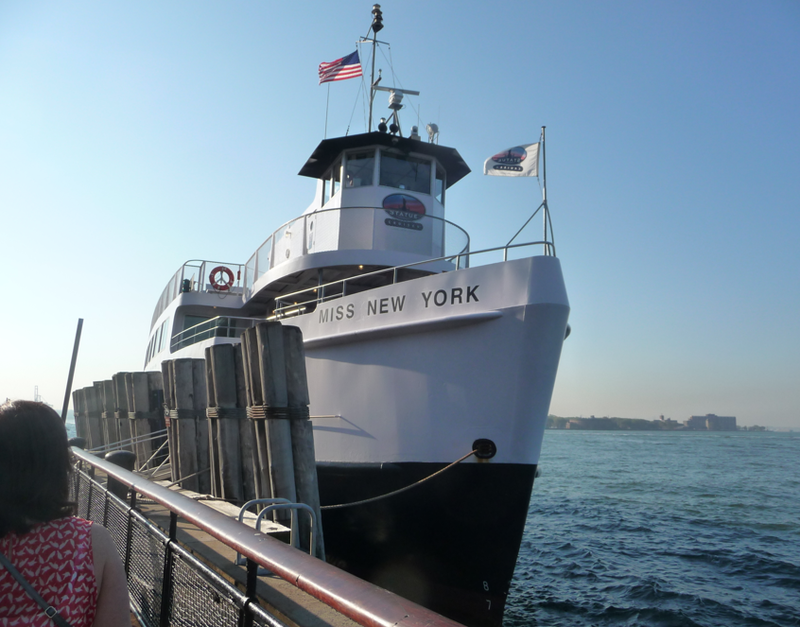 The cruise gave us an incredible view of both Ellis Island and Liberty Island... as well as countless other NYC landmarks like the Freedom Tower, Brooklyn Bridge and Grant's Tomb. Inscribed on the Statue of Liberty's pedestal is a section of Emma Lazarus' Poem "The New Colossus" - "Give me your tired, your poor, your huddled masses yearning to breathe free..." She is a true symbol of freedom! I just read the book called "What is the Statue of Liberty?" I learned a lot about the statue and when it was built. For example, I learned that it was 151 feet tall. It was designed by Bartholi and the idea to make a statue as a gift for the UNited Stated was from Laboulaye. Did you know that they almost didnt have enough money to finish the pedestal it stands on and Pulitzer had to raise money so it could be completed? Pulitzer said he would publish everyone's names in his newspaper if they donated money. So lots of people donated money and the pedestal was finally finished. Did you know that when the statue was first revealed, Bartholdi accidentally removed the flag from the statue and revealed it before the president of the United States spoke? Did you learn anything else interesting about the statue when you visited it? That's incredible! Could you imagine if they hadn't raised enough money for the pedestal? Lady Liberty would look a lot different and a little bit shorter! We did learn something else very interesting when we visited. 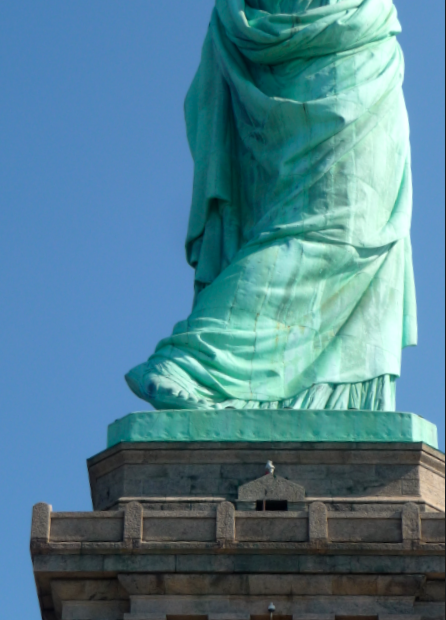 We know that the Statue of Liberty was a gift from France, but did you know that America also gave France a Statue of Liberty? Three years after Lady Liberty arrived in New York, America reciprocated with a quarter-scale version of the Statue. The Statue sits on the southern end of the Ile aux Cygnes on the river Seine in Paris. When looking at the Statue from the front, you can see the Eiffel Tower high above her left shoulder. Thank you for the great information Dylan! I enjoyed reading this post about the Statue of Liberty. 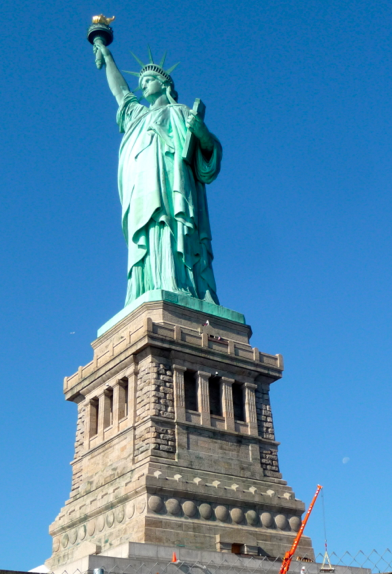 Last Spring Break, my family visited New York and saw the Statue of Liberty. We took a boat ride and lapped around the statue seeing her beauty from every angle. As we went by, I thought about my grandparents (Katie's great-grandparents) who came to New York on a boat in the 1940s following World War II. They arrived in the United States with nothing and looked to create a new life. The Statue of Liberty was the first thing they saw as they entered the waters of the USA. It represented freedom and liberty for them. They made New York their home before moving to Los Angeles a decade later. This past summer, our family also saw another version of the Statue of Liberty on the Seine River in Paris. 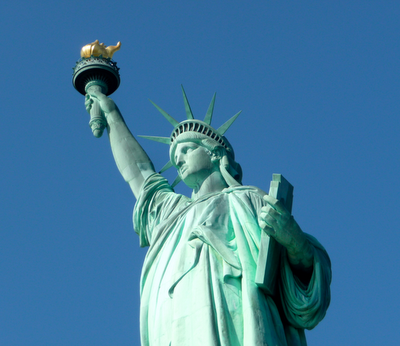 It is there because France originally made the Statue of Liberty and gifted it to the United States. Has anyone else visited the Statue of Liberty?